I’m a new user to this phenomenon that is Twitter. I know, I know, where the hell have I been, right? Well, not on Twitter. Anyway, I’ve jumped on board the TwitterTrain and I’m now following all these fantastic foodie types. One of these is Gourmet Traveller, the magazine, and when this little beauty hit my news feed, I was on it like a Springer Spaniel on a Canberra black truffle in the month of June. My intention was to make them for my hard working team, to give them some energy and sugar/cocoa based motivation heading into the pointy end of the end of financial year, which is a manic time for those in procurement in Government. What I didn’t reckon on, was that the recipe didn’t make that many, and although my team isn’t massive, they’ve quite the appetite for all things chocolate and baked. 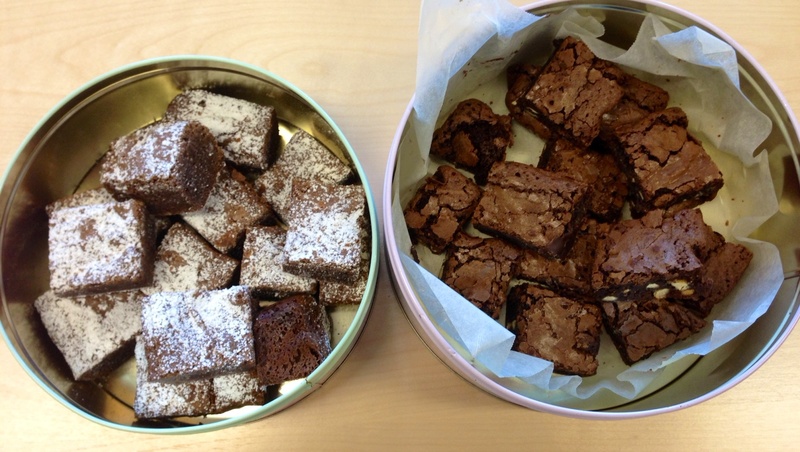 So, halfway through baking these I thought I’d better make another batch to feed as many as possible, who doesn’t love a brownie for morning tea in the office? But then I ran out of cocoa powder. So it was on to a different recipe. More of that later. 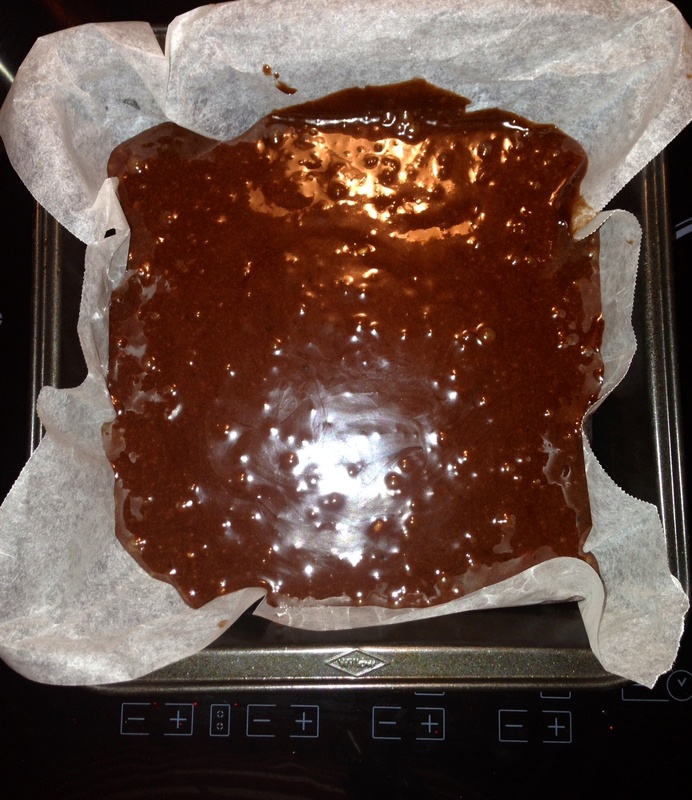 Preheat the oven to 160C, and line a 20cm tin with baking paper. I think my tin was smaller so it took a bit longer to cook than the stated time of 25 minutes. I never measure my tins. Combine sugar, butter, cocoa, coffee and a pinch of salt in a heatproof bowl over a saucepan of simmering water, and stir occasionally until melted and combined. Take off heat and allow to cool down. The mixture will split a little, and seem grainy but that’s fine, just give it a stir. When it’s cooled down a fair bit, add the eggs, one at a time and stir vigorously until combined and the mixture is nice and shiny. See, shiny. 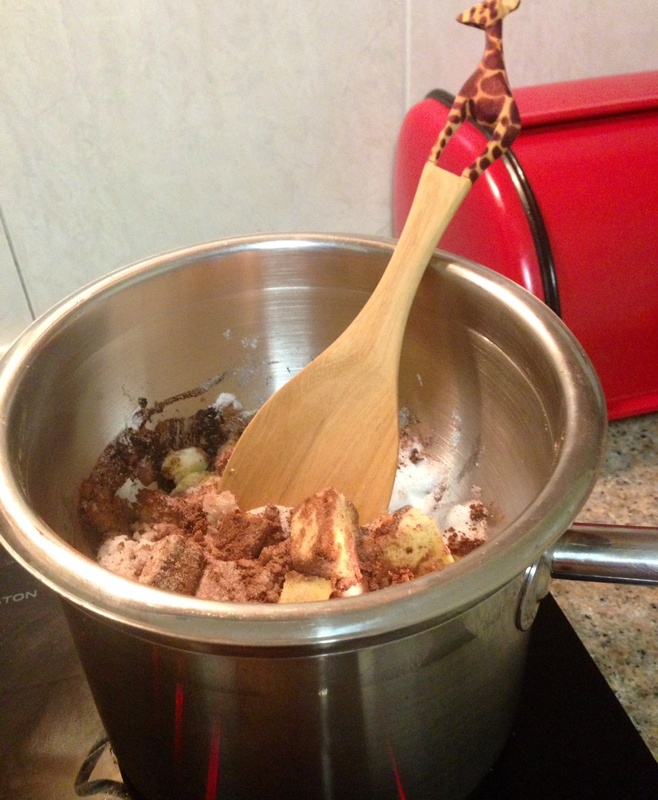 Have you also spotted my new giraffe wooden spoon? 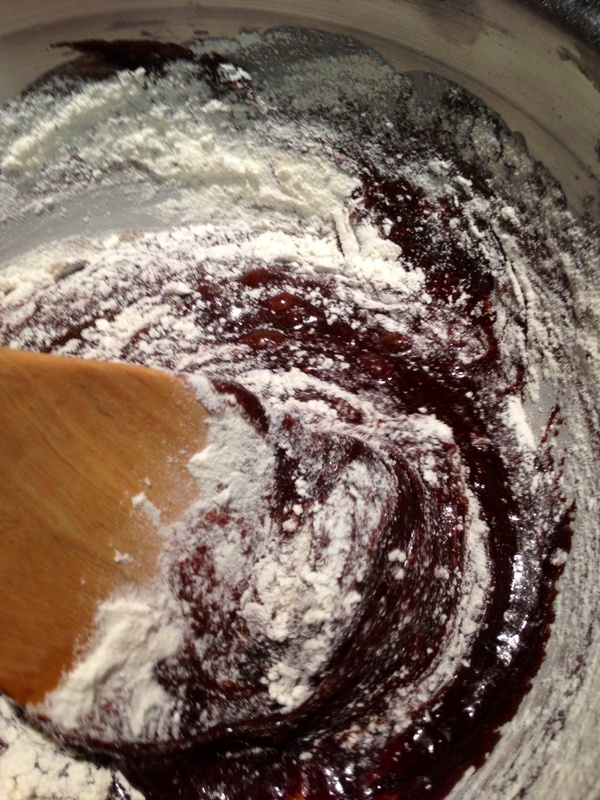 Add the flour and beat to combine. Don’t worry about overmixing this as it doesn’t need to be light and fluffy, in fact you want it the complete opposite. 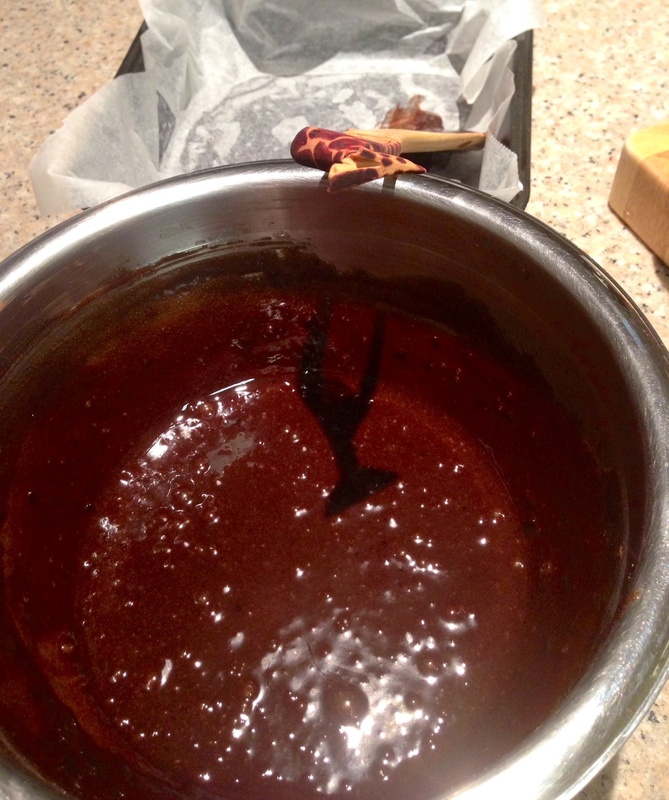 Add the choc bits, stir so the bits are well distributed and pour into your prepared pan, smoothing it out as much as possible. Pop it into the oven and, this is where it gets a little odd, as mine baked for nearly 40 minutes, unlike the recipe which states it takes about 25 to 30 minutes. I’m also getting used to my new oven, and used an automatic baking setting, which means it might bake a little slower? Who knows. Anyway, bake until a skewer inserted comes out clean. I read somewhere that said if it wiggles in the middle it’s not ready (as I sit here listening to Jason Derulo’s wiggle wiggle). The top should be nice and cracked, but it should still seem a little underdone. 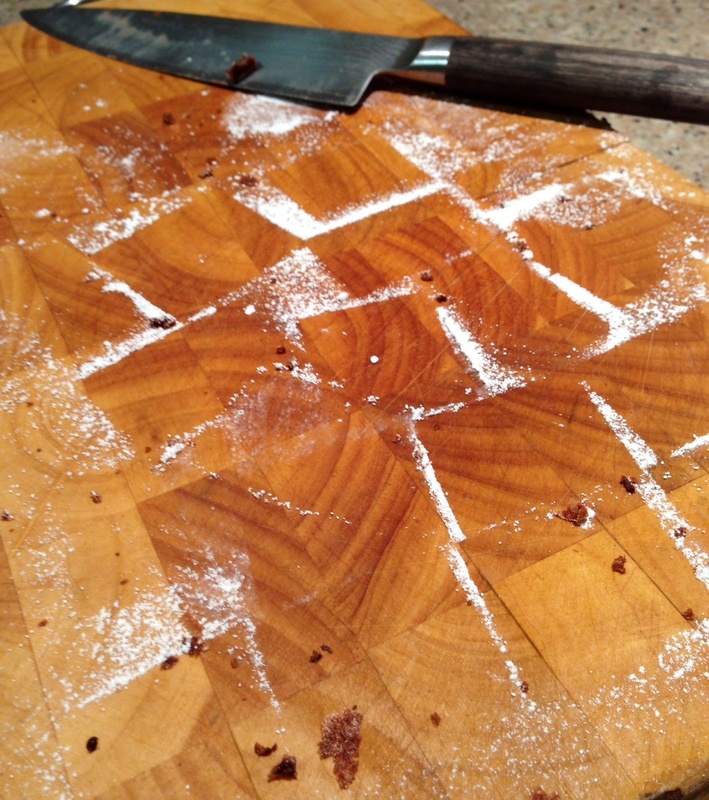 Set it to cool on a cake rack and don’t try to cut it while it’s still very warm as it will likely collapse. I actually thought mine was undercooked as it was still quite sticky in the middle, and they sink like the Titanic on resting, so don’t be alarmed. 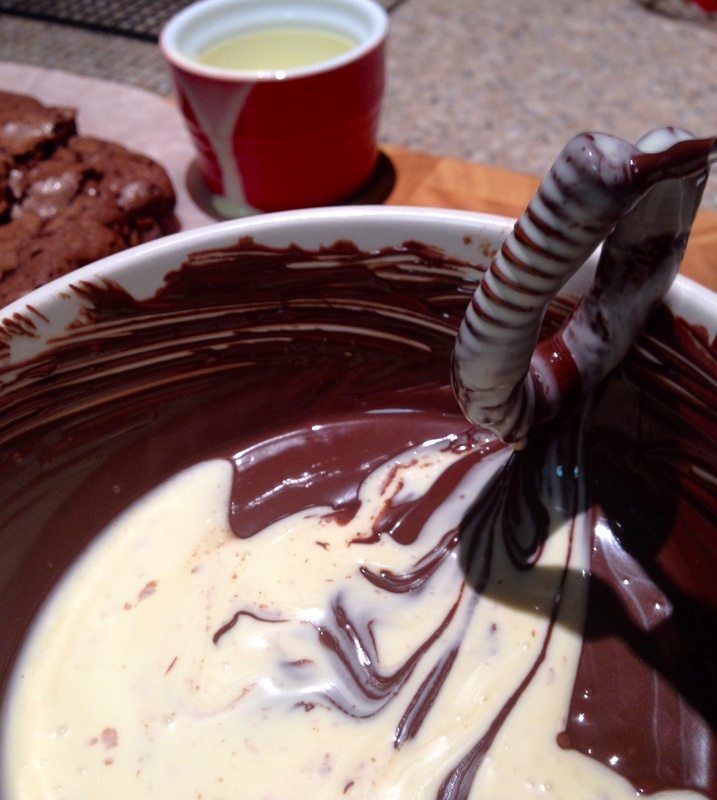 The stickiness is what leads to the complete smoodgy fudginess the next day. They’re much much better the next day. 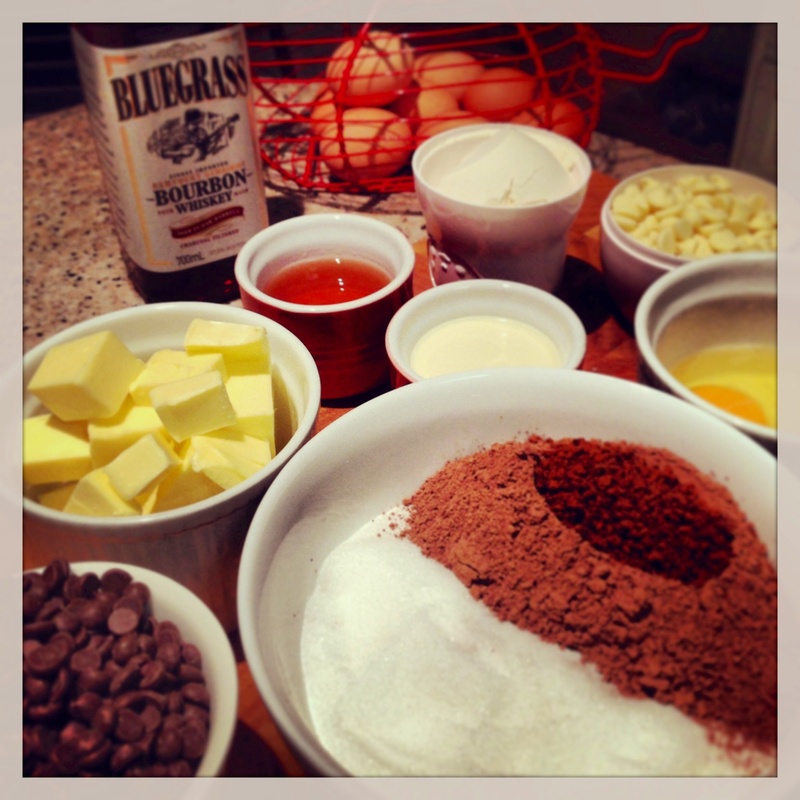 To make the bourbon sauce, add the chocolate to a microwave bowl and blitz for a minute or two at a time until the chocolate melts, stirring in between each burst. 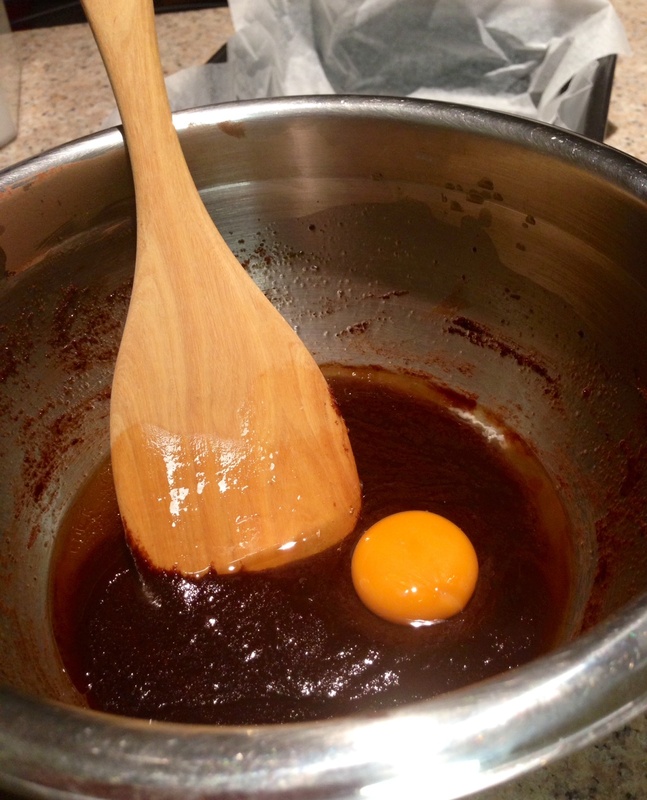 Add the bourbon and cream and stir until it’s shiny and delicious. It may seem like it’s going to seize on you when you add the bourbon, but keep stirring and it’ll come good. 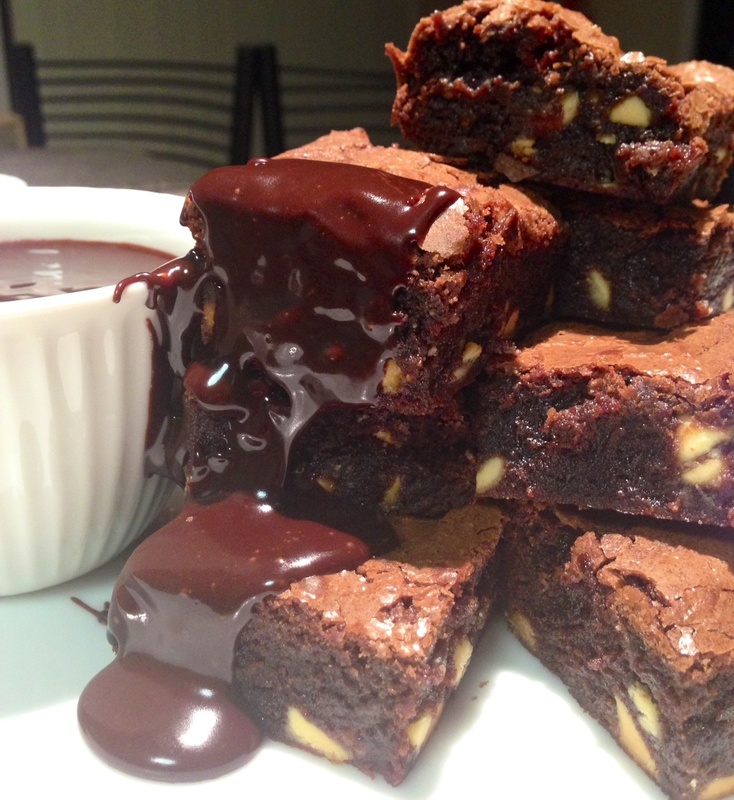 Chop your brownies up, add the chocolate sauce and enjoy. They are literally finger lickin good. Ok, so when I figured out I’d need to bake two lots of brownies to keep the troops happy, I realised I’d used all the cocoa for the first batch, so I had to find another recipe. I found this one from Journey Kitchen as it looked simple and had rave reviews. I followed the directions, which were pretty much the same as those above. The difference with this batch was that the mixture was much thicker, like a cake batter. The ones on the left are the chocolate only mix, the ones on the right were the double choc cocoa attempt. 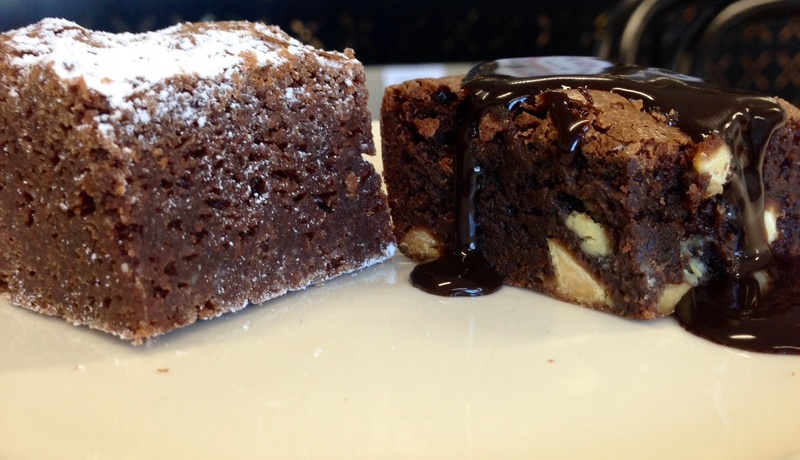 Two completely different style of brownies. 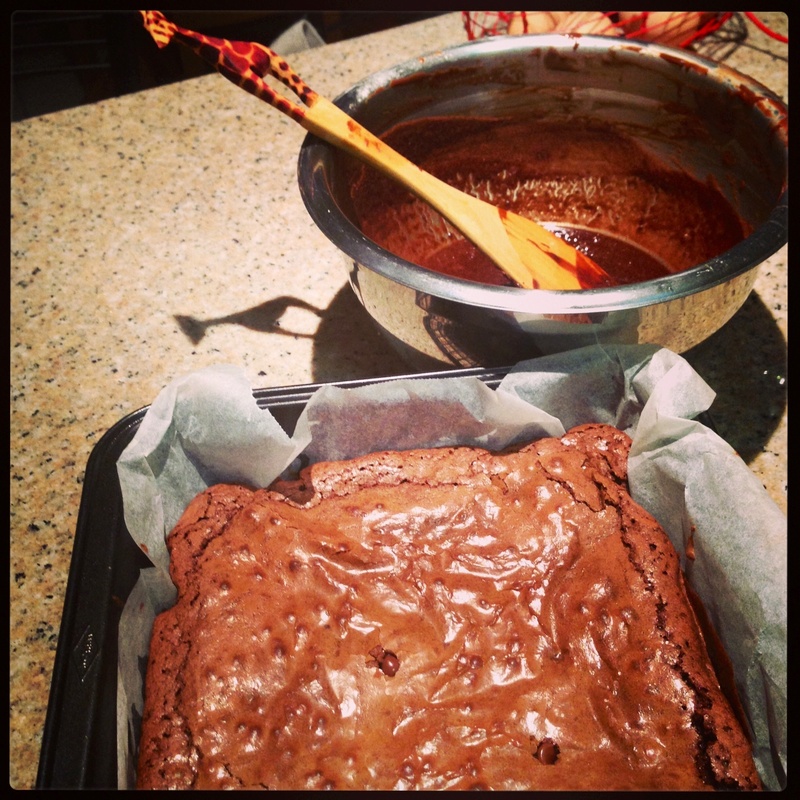 So, I decided to do a brownie challenge, which was the nicer recipe? My work colleagues would be the judges. Poor them. The results were unanimously divided. Both were declared delicious, and both seemed to have their place on the menu. 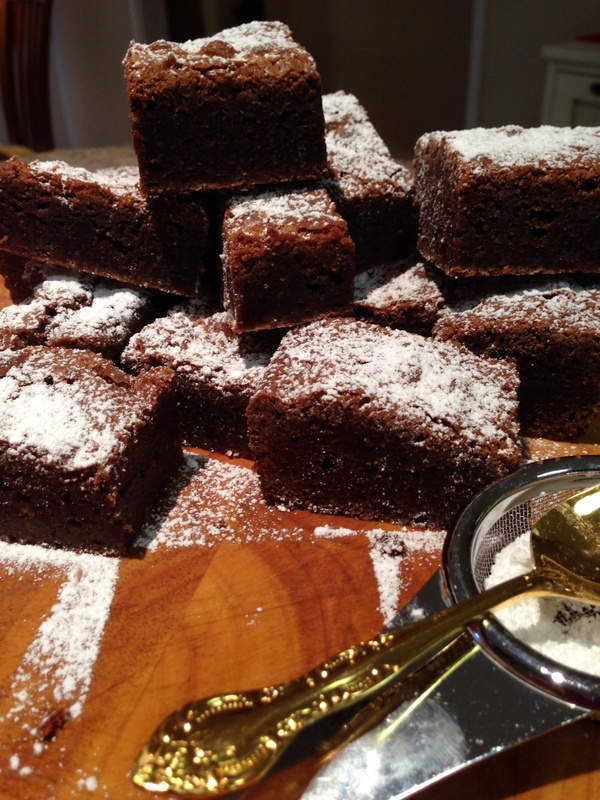 The plain brownies are apparently perfect for afternoon tea, with a cuppa and a chat, fudgy and dense in the middle with the required crunchy top and base. 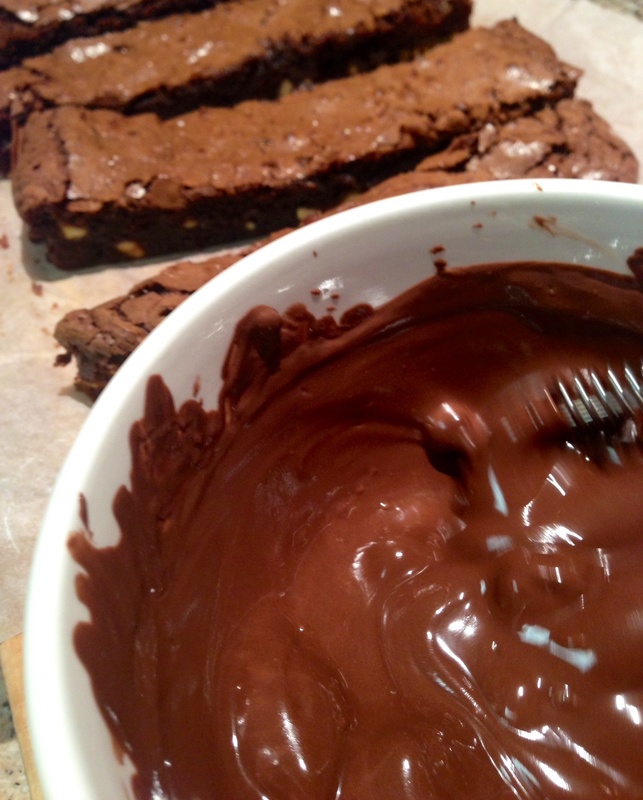 The gussied up brownies with their rich decadent alcohol laced sauce were perfect as an after dinner treat, rich, moist and softer middle with a delicate crackly top and base. 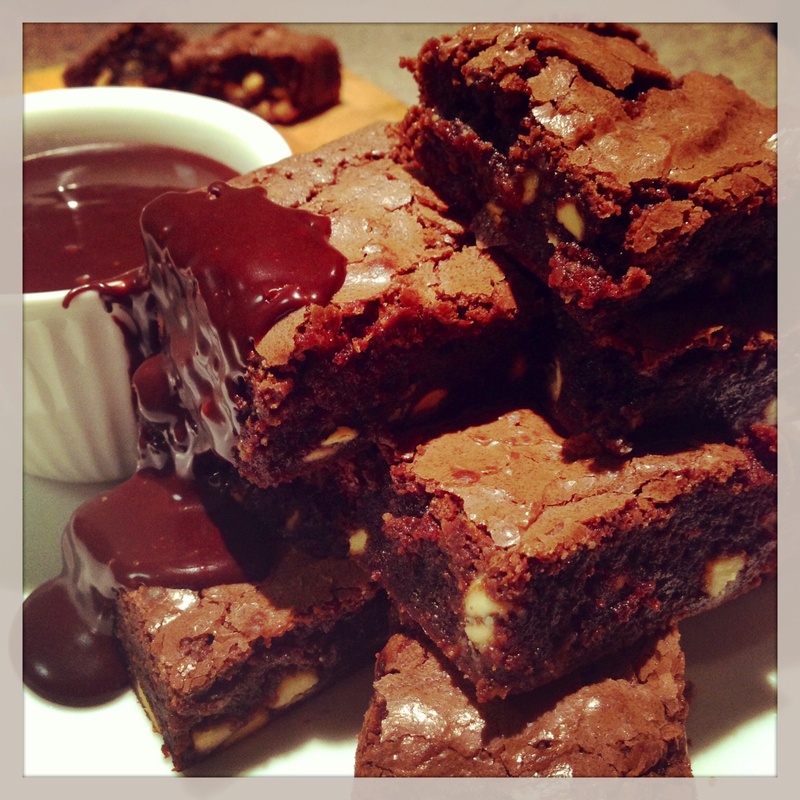 Surprisingly, the cocoa brownie had a much more chocolatey flavour, while the melted chocolate one was much lighter. Lucky for me I have the leftover bourbon sauce in my fridge awaiting a childfree moment, to be heated up and poured over vanilla ice cream, with a hot toddy on the side. Yeah, Anna, I stacked the odds in my favour, being the only entrant in the bake off, lol 🙂 I’m happy to bake for anyone! Seriously. Welcome to twitter and yes on that bourbon sauce. Thanks Angela. And yes to bourbon anything! Oh my, what can I say?! That looks so amazing, I want to make it RIGHT NOW!! Pretty easy to make too. And delicious!! Win win. Oh my goodness! What a challenge. That’s the kind of challenge I’d like to partake in! Thanks so much for linking up to Thriving on Thursdays. I’m sure my readers will love this. I’m featuring it at tomorrow’s party. Hope to see you again soon. Thanks Anne! It was a fun challenge. My work colleagues are keen for me to try it again, lol. I’ll definitely visit again, it was great to read everyone’s links.